But in all seriousness now, seeing how we dedicate so much of our lives to the blinking cursor in an email, it’s great to, every once in a while, take a step back and look at the bigger picture. So, how many emails did you send last June? How long does it usually take you to answer an email? Are you the busiest one in the office; are you an essayist that sends 1000 word emails to everyone? With the click of a button you can finally know for sure! 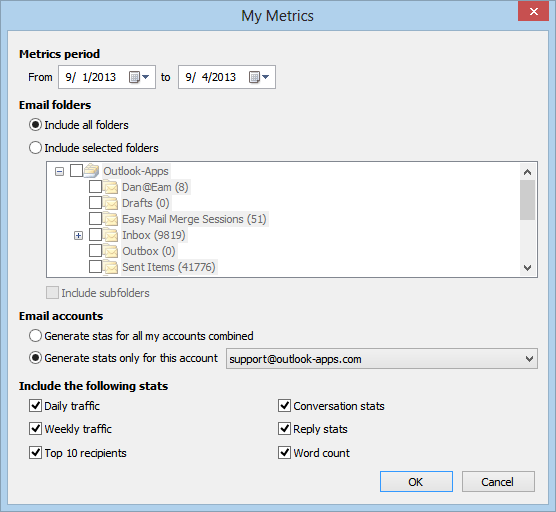 Hard, cold, unquestionable data is available straight from the Outlook interface in the brand-new Email Metrics for Outlook feature. Also… graphs!WOOHOO! 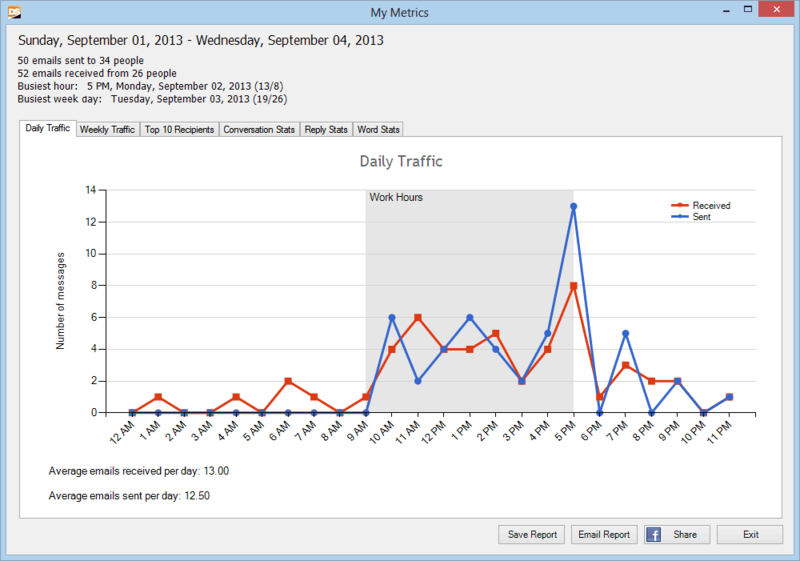 With the Email Metrics for Outlook feature you will be able to create detailed reports and statistics regarding your email habits – from how soon you reply, how many words, in average, you write to which are your top 10 recipients and what is your daily/weekly email traffic… and many more! It’s all done with just a few clicks in which you can specify a time period for Bells&Whistles to “scan” for the email statistics, a location (if you’re only interested in particular folders), specific email accounts and which statistics you are interested in. Oh, and don’t worry – even if you have a LOT of messages and choose to see all email statistics available, it only takes a couple of seconds’ time. You will also see progress bars for each account so you always know how long it will actually take. This may seem biased, but I honestly, reaaaaly love this new toy! Even if I’m not a stats-junkie as some of you surely are, now I’m finally able to see how I’m using my emails. The pretty graphs are just an added bonus! The coolest thing is that I didn’t even know I wanted all this info until now – for example, my busiest hour last year was 5 PM on the 27th of September… I don’t know, I was probably crunching for the weekend or something. Do you know when you were the busiest bee in the office? Wouldn’t it be cool if you did? Another example – I usually write between 200 and 400 words per email, while another colleague is in the 50s range… this mostly has to do with our jobs, since I’m with the marketing blurb and he’s in another department. Well, in a bigger office, one could evaluate (with hard data backing it up) the difference between employees that have the same email tasks. If you’re feeling particularly good about your email metrics, you can even share them on Facebook, for all the world to see what an email addict you are. Or… you know, save them for posterity or email them directly to someone. Give it a try, we’re sure you’ll enjoy learning more about your email habits! And, if graphs and stats are your kryptonite and you want nothing to do with either, there are still 40+ features to benefit from in Version 5 of Bells & Whistles for Outlook! Is there a way to see reply stats “above one day” in more detail? Such as the average number of days before I reply, rather than hours? For the moment, no. But we are working on a new product version which will feature an extensive update on the metrics engine (including the detailed stats that you need). We can’t give you a very clear ETA on it, it might be a couple of months away from its release.